The technology we are using today would have been considered futuristic just ten years ago, and science fiction twenty years ago. Almost no other profession seeks to be as ‘invisible’ as the dental profession. Just as you want your restorations to be seamless and harmonious with the rest of your smile, the process of making those restorations is often just as inappreciable. This is where advancements in technology have had their greatest impact, operating behind the scenes to give us results that are more predictable, longer lasting, and more esthetically satisfying than ever before. Here is a story that represents a typical situation of replacing a missing tooth, demonstrating several of the newest technologies at work in the background: 3D imaging (X-ray), 3D printing, dental implants, digital scanning, and CAD/CAM (Computer Aided Design/Computer Aided Manufacturing). After losing a tooth recently, our patient decides to replace it with a dental implant. The first step is to make sure there is enough bone in the area to support an implant and that there are no anatomic structures in the way (nerves, tooth roots, etc.). This is done by taking a 3D X-ray using Cone Beam Computed Tomography, or CBCT. Standard X-rays only show us two dimensions: up/down and right/left. CBCT gives us the third dimension, front/back, that is essential for proper implant planning. While CBCT has been around for a while, only recently has it become compact and affordable enough to install in a private dental office. The resulting image allows us verify that the area is suitable for implant placement, and then with the associated software, we can virtually place the implant in the desired spot. With the planning complete, we send the CBCT image to the 3D printer to make a surgical guide. The guide is designed to fit over the adjacent teeth and orient the handpiece so that the implant goes exactly where we want, meeting our three criteria of proper placement: insertion point, orientation, and depth. 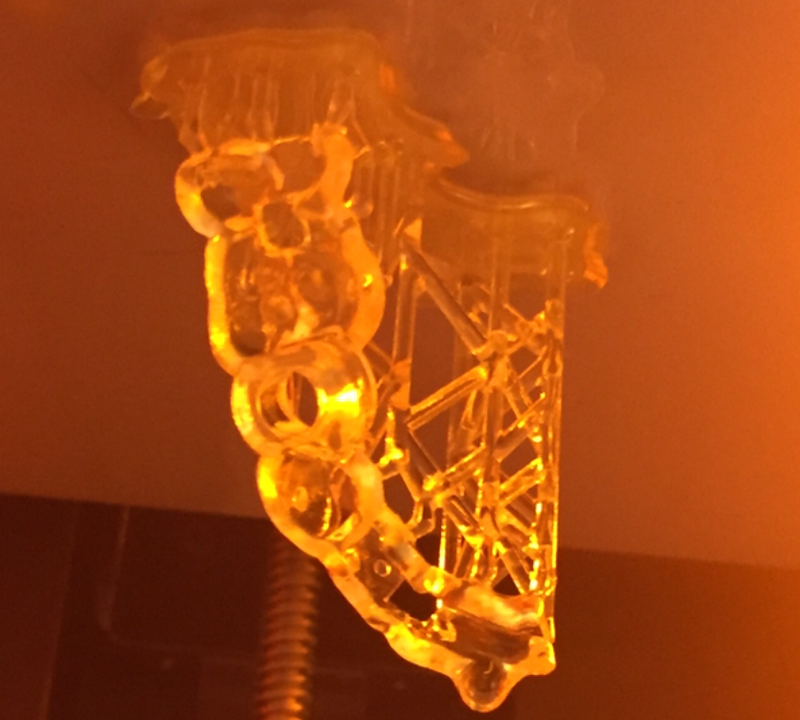 The 3D printer uses a laser to cure a liquid resin and build the guide layer by layer. Thirty minutes later our guide is printed and cleaned, and we are now ready to place our implant. Dental implants are typically made out of titanium and are about the size of two tic-tacs lying end-to-end. Do they still make tic-tacs? Anyhow, it turns out that the body really likes titanium, so much so that bone will actually bond to it. This was discovered accidentally in 1940 and was termed ‘osseointegration’ by Per-Ingvar Branemark, a Swedish physician who actually placed the first dental implant in 1965. This discovery revolutionized the field orthopedics, paving the way for modern joint replacement components. Today, the vast majority of artificial joints are titanium-based (or cobalt-chromium). Titanium’s impact on dentistry has come along more slowly, but surely as dental implants are gaining acceptance with insurance companies and patients. You may be wondering, “Today’s implants aren’t made out of the same stuff that was used in the 40’s, are they?” And in fact you’re right, just as we’ve moved on from polyester clothing and avocado green appliances, the implants themselves have evolved over time, both in design and composition. A buzzword you may have heard a lot lately is ceramic. Ceramic cookware, ceramic knives, ceramic watches, and of course ceramic dental crowns. At one time the term ceramic simply referred to mugs, dishes, and vases. Certainly our pans, knives, watches, and crowns aren’t made of the same material, which is basically clay baked in an oven. The distinction is the term porcelain, which generally refers to clay-based items, and the broader category of ceramics. So what exactly is a ceramic? Ceramics form a rather nebulous category that includes many different materials, but for our purposes a ceramic is a combination of two or more elements that form a crystalline pattern when set and have certain common properties. By comparison, combining two metals together produces an alloy (like copper and zinc form the alloy brass), but modern ceramics are often a combination of a metal, such as titanium, tungsten or silicon, and a non-metal, such as carbon, nitrogen, or oxygen. Ceramics are also typically very hard and brittle. If you hit a metal or metal alloy with a hammer you will leave a dent, hit it harder and you will get a bigger dent. Hitting a ceramic will not leave a dent, but hitting it too hard will cause it to shatter. Modern ceramics are all around us. Carbide cutting tools are actually tungsten carbide, a ceramic of tungsten (metal) and carbon (nonmetal). Titanium nitride is a combination of titanium (metal) and nitrogen (nonmetal) and is the coating used in the titanium ceramic cookware you see advertised. Borosilicate glass, a combination of boron (metal), silicon (metal), and oxygen (nonmetal) is more commonly known as Pyrex. Even though these ceramics contain a metal element, the ceramic itself is not considered a metal because its properties are often vastly different. In particular their appearance can range from metallic, to transparent, to white, as is the case with zirconium dioxide (a combination of zirconium and oxygen). Zirconium dioxide, or simply zirconia, is the material of which ceramic knives are made, and also represents a new class of dental implants. In the spectrum of dental implants, pure titanium would be on one end and pure ceramic, such as zirconia, would be on the other. 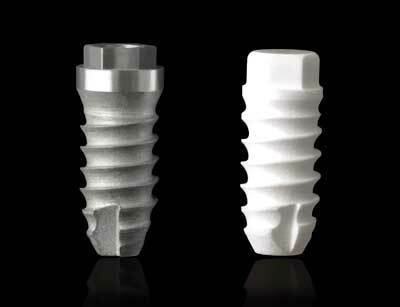 Most implants placed today fall in the middle, with the body of the implant made out of titanium and an outer coating of a ceramic material. The most common coating is hydroxyapatite, which is a ceramic of calcium (metal) and phosphorus (nonmetal). This coating enhances bone adhesion, decreases chances of an allergic reaction, and decreases healing time. These beneficial properties are due to the fact that hydroxyapatite occurs naturally in bone and teeth, and thus is referred to as a bioceramic. Titanium with a hydroxyapatite coating gives us the best of both worlds, making it the preferred choice for dental implants as well as joint replacement parts and other uses. Pure zirconia implants have the benefit of being white, which may be helpful in situations where the implant may be visible through the gum tissue, such as when they are used to replace front teeth. The disadvantage is that, since they are a ceramic, they can be brittle and prone to fracture. A fractured implant that has already bonded to the bone can present a challenging and expensive situation to rectify. The implant placement procedure is systematic; the guide removes any guesswork and allows the procedure to move along swiftly. From anesthesia to the final suture (if needed), the whole process takes about 45 minutes. Our patient is given a prescription for ibuprofen and an antibiotic mouthrinse and the implant is allowed to heal, typically four to six months. During this time a temporary crown can be placed, or another method can be used to ‘fill the gap’ while the implant heals. The implant itself is only one of three components. 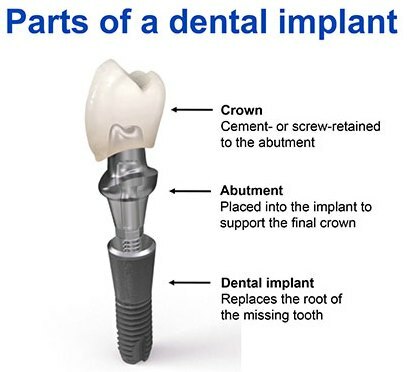 A final crown must be placed later to fully represent the missing tooth, and between the implant and crown is the third component called an abutment. Once adequately bonded to the bone, the implant is now ready to have the final crown made. Up until this point the implant has been hidden under the gum tissue, nearly invisible except for a small healing cap. The healing cap is removed and a small post is attached for the digital impression. Our intraoral camera is a wand-like instrument with a lens at the end, we hold it over the implant site and it takes a series of images to generate a 3D representation of the area. The post is removed, the healing cap is replaced, and the 3D ‘impression’ is sent to a dental lab for fabrication of the abutment and crown. 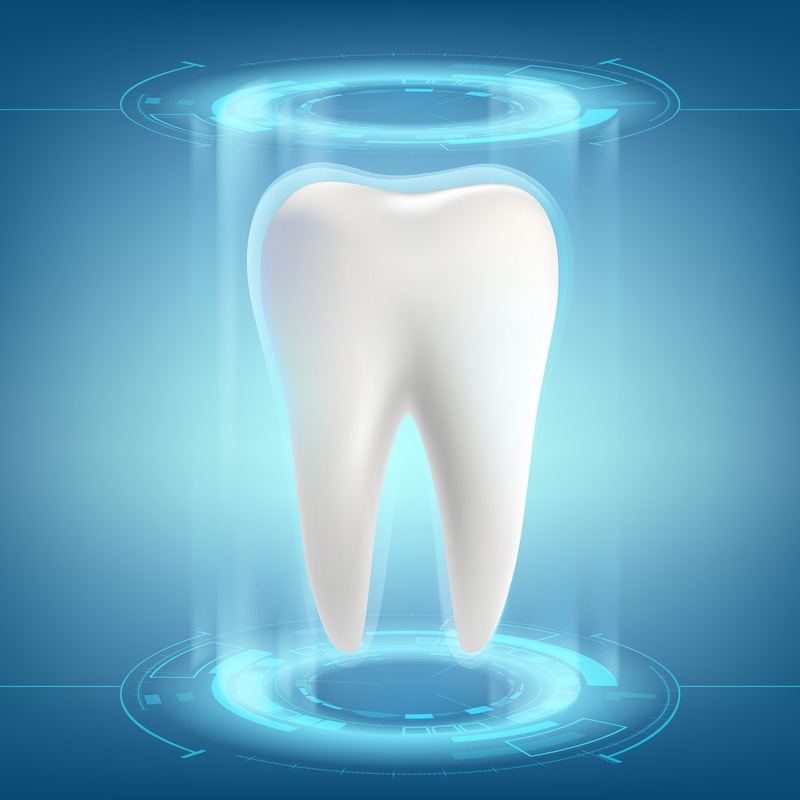 Even dental labs have moved into the 21st century with their technology, utilizing CAD/CAM to streamline their processes. The digital impression is loaded into a software package to design the abutment and crown. What technicians used to do by hand they now do on a PC; the same skills are at play, but a different medium is used to deploy them. 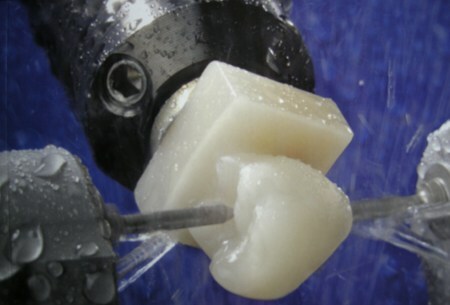 Once designed, the parts can be created in a computer-controlled milling machine from different materials: the abutment is often a gold alloy or zirconia (if it might be visible), and the crown can also be made from zirconia or another type of ceramic. The crown starts out as a rectangular block and diamond-tipped cutters mill away the extra material until a crown emerges ten minutes later. The technician then adds custom shading, polishes everything up, and returns the components to the dental office. The big day has arrived! Usually without needing any anesthesia, the healing cap is removed and the abutment and crown are attached and checked for proper fit and bite. Our patient is ready to immediately start using the new tooth, and in fact our instructions are to treat it as if it were a natural tooth: brush, floss, chew, smile! With proper care an implant can potentially last the rest of one’s life. The materials, techniques, and instruments of tomorrow are being developed today. Dental implants will continue to evolve, giving us even easier placement, quicker healing, and more reliable results. Someday we may not even need implants; research is currently being conducted to regrow a new tooth right in the patient’s jaw. Sound like science fiction? Maybe today, but one day it might be science future, and soon after become science fact.